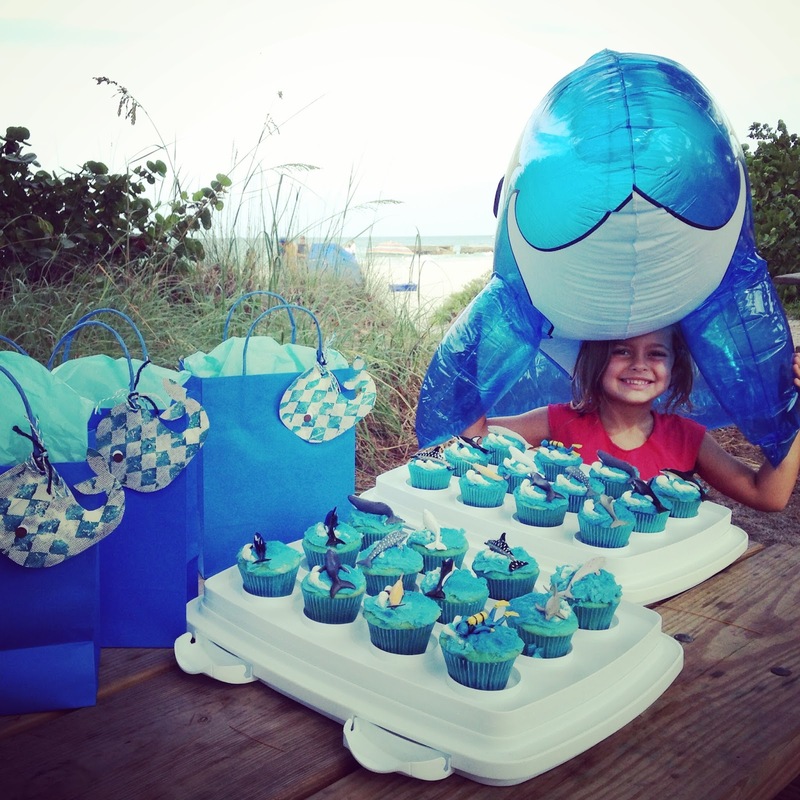 Last year Scarlette had a stingray birthday party, and only a few days later announced she wanted to have a whale party for her next birthday. Well, that next birthday has come and gone and she stuck to her whale wishes. I had a difficult time finding whale inspiration due to my procrastination so I pretty much had to get creative. We kept a box for the girls and they really do work pretty decently. The size can be kinda small, but still waaaaay better than endless hours filling one at a time. Since the favor wasn't whale-ish I packaged them in blue bags attached with a big whale I cut out and decorated. Corny wording a must. 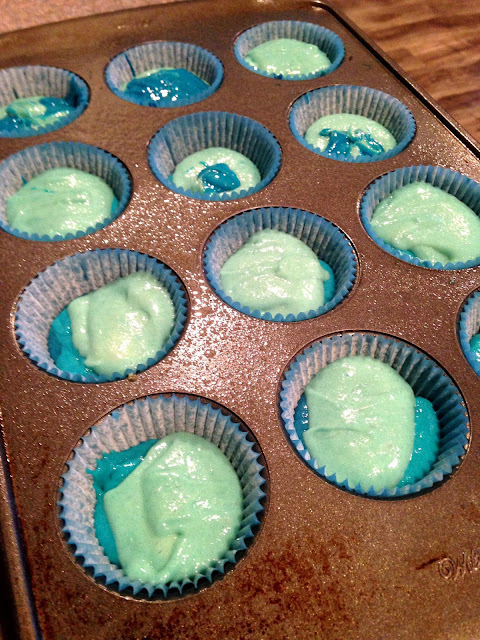 Scarlette requested blue raspberry cupcakes. I saw a box of them in Publix months ago by Betty Crocker or Duncan Hines, but of course, when she tells me this I go back and they are gone. 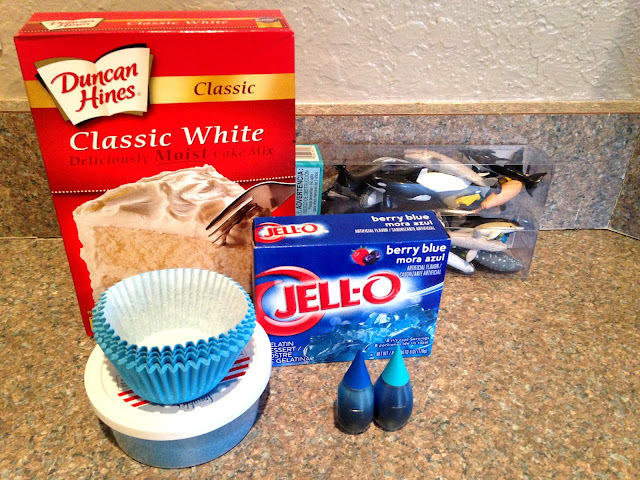 I improvised by adding Berry Blue Jell-o to a box of Classic White cake mix. Make cake batter as directed on the box. 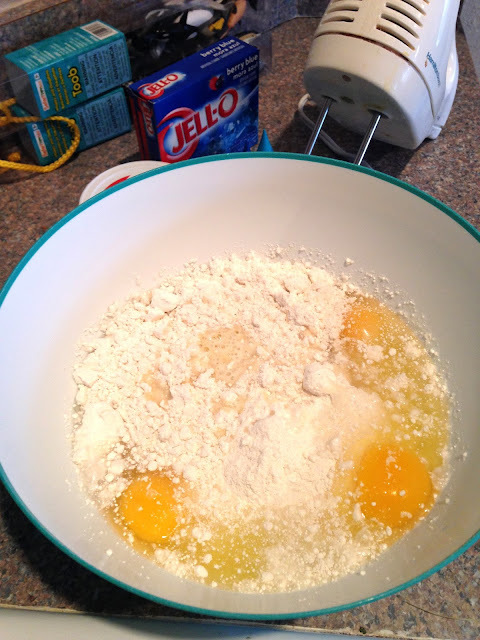 Add 3/4 cup of Berry Blue Jell-o to the batter. I also add 1 tablespoon of melted butter to boxed cake mixes for extra richness. Beat ingredients together then separate into three bowls and add varying amounts of blue food coloring to create a multi-hued layer effect. Beat all ingredients together. 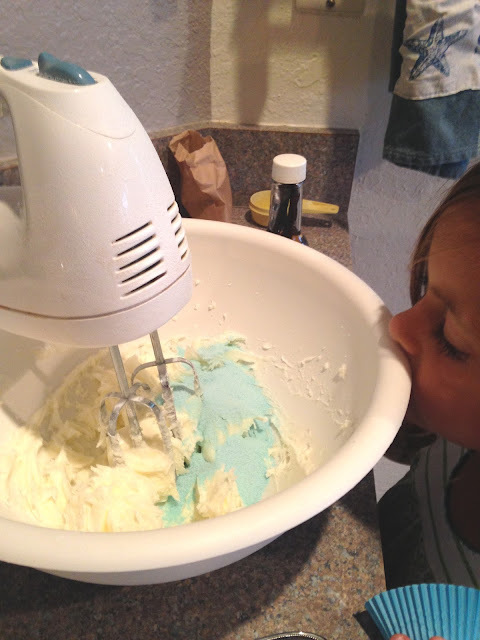 Save about half a cup for decoration (making frothy waves). Add the remaining Berry Blue Jell-o powder to the frosting and beat. Add blue food coloring if desired. Bake as directed on box. 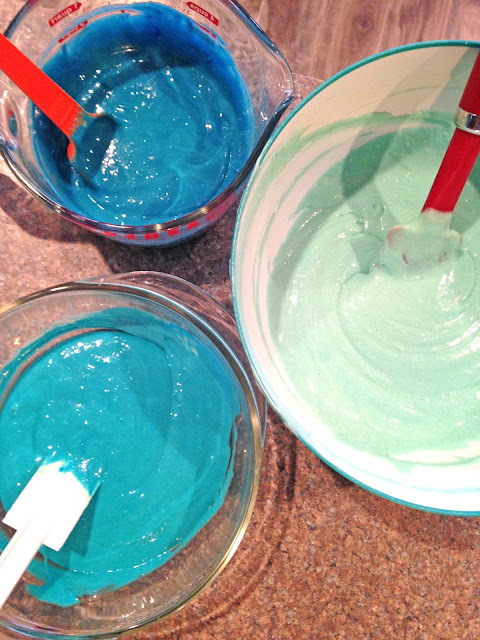 Layer the batters to create an aquatic sea effect. 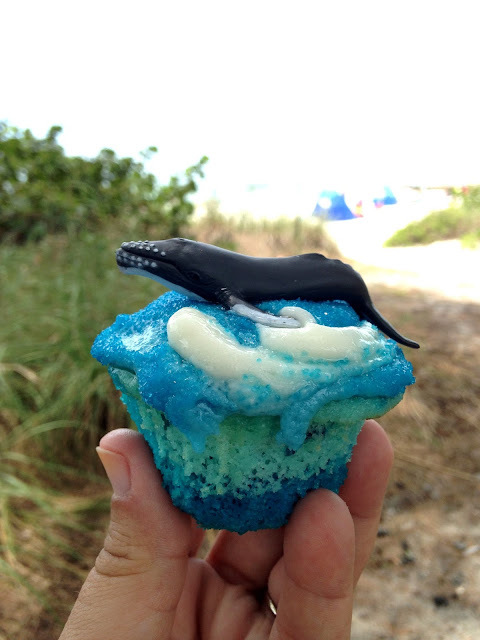 Once cooled, frost with blue icing, add some white "waves" and blue sprinkles. Top with a whale (if you can find them- I went to 6 stores before I found them at Michael's Craft Store). I was worried about the flavor, but they turned out pretty good. Sweet but not overbearing. A fun cupcake flavor for a change from vanilla or chocolate. We packed up our cupcakes, favors, coolers, beach things and headed to Coquina Beach. The weather held up nicely and it was a fun day at the beach. We even got to see a few sea turtle nests. Both girls will now be in the same class next year, the 6-9 year old class, at their school. No more babies in the house. But I must say that they are both at a really fun age and I love watching them come into their personalities and ideals. These years of themed birthdays won't last forever. I look forward to the next challenge they throw at me. No whale birthday shirts? I remember you making the sting ray shirts last year. I asked her just now and she said.... Foxes! So out of the water and into land. Ooh, foxes! And fox things seem to be everywhere right now so you could stock up early....and hope she sticks with that idea. I'm really getting into foxes lately. Yes!!! That is my conundrum. Buy now while it is available and risk a mind change (a year is a long time in a kid's life) or wait and risk it going away. I love foxes too! And it could make an adorable woodland theme. Acorns, trees, leaves, little critters and grass covered dens. My rain is already whirling. That is so sweet! I will try to keep up the fox love too!! I'll have to grab a cute little fox of some sort now, if I see one. LOL! You are the coolest mom ever, Julie. You take such time and put so much love into your parties and cakes and goodies. 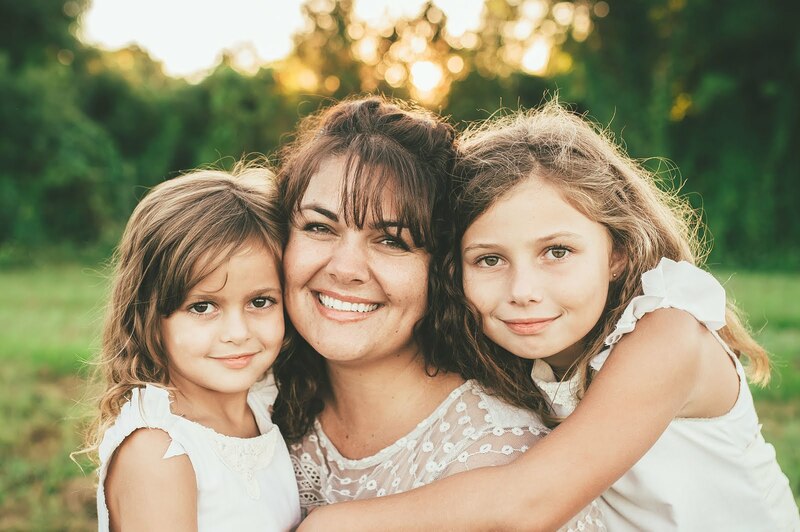 Your kids are so, so lucky! I love that she mentioned wanting a whale pary LAST YEAR and you remembered and did it for her! They look so happy. Those cupcakes are really neat!! What a cool party idea! You are soooo creative! 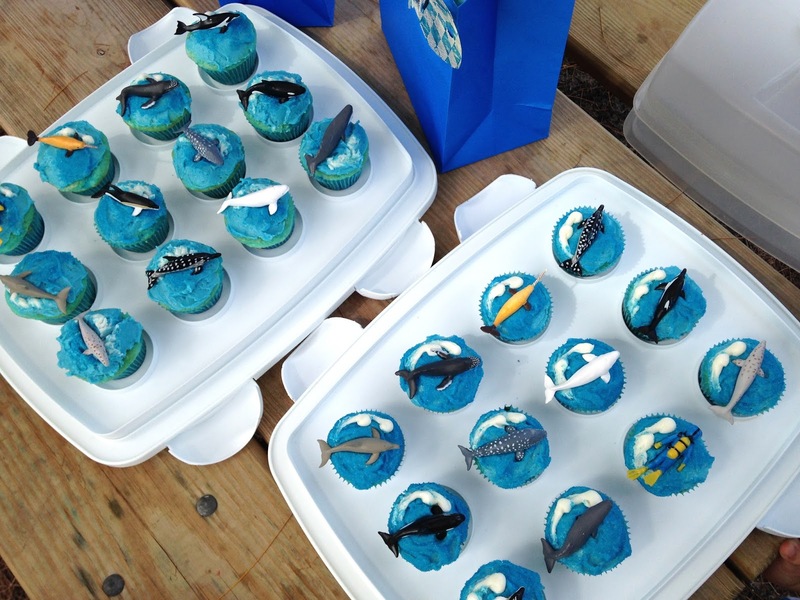 Love the cupcakes, they look delicious! I just take the orders for the theme from the kiddos and go from there lol! Thank you! Hope you have been able to find some opportunities to enjoy the summer.